iPhone 7 Plus power off for the first after totally 3 hours 33 minutes. At this time, XIAOMI MIX 2 has 13% power left, K10000 PRO has 71% power left, while K8000 still has 79% power left. Xiaomi Mix 2 power off secondly after totally 3 hours 53 minutes power consumption. By this time, K10000 Pro still has 67% power, K8000 has 77% power left. When K10000 Pro goes power off, K8000 still has 38% power left. power when it shows colors which meas it won’t consume any power when the display is in black. Μεχρι 33% εκπτωση στα κινητα OUKITEL, μεχρι ΑΥΡΙΟ! OUKITEL MIX 2 runs on Android 7 OS with GMS certified. It features a 5.99 inch 18:9 full display, you can hold and handle it in one hand. It gets 6GB RAM and 64GB ROM with helio P25 Soc, On the antutu test, it gets 62858 Antutu scores. With large running space, no need to worry about stuck in system any more. 4080mAh battery supports 2 days normal use and fingerprint protects device and data. In camera, it gets dual-lens camera and offers 6 shooting modes: normal, FaceBeauty, Blur, Mono, Panorama, and PRO. You can adjust the best effect to be a professional photographer. FHD+ display with 1080x2160 resolution shows images, videos, game visual effects perfectly. Since OUKITEL C8 gained much attention after announcement, OUKITEL is releasing an upgrading version for it which is C8 4G. With same 18:9 and dual glossy design, more excellent handling experience with super cost-effective, will C8 4G become more popular than C8? As an entry-level 4G star product, C8 4G is devoted to become next best seller which could be more attractive than C8. 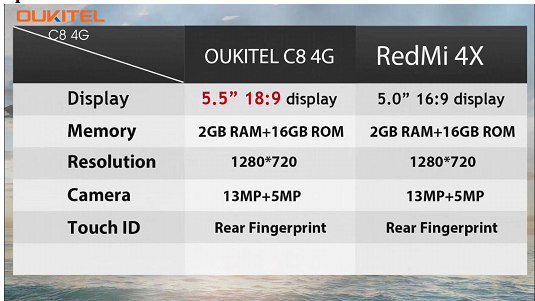 Today we have a comparison and show you why OUKITEL C8 is worth buying. Though same 13MP and 5MP pixels in cameras, C8 4G and Redmi 4X gets different photo effect. With longer display, OUKITEL C8 4G will take larger photos. Το μεγαλύτερο ατού τις xiaomi έναντι άλλων εταιρειών τύπου OUKITEL, εκτός από την ποιότητα κατασκευής, είναι το MIUI το οποίο είναι από τα ποιο όμορφα και πλήρη android interface. OUKITEL is bringing a new finely designed smartphone OUKITEL K5. 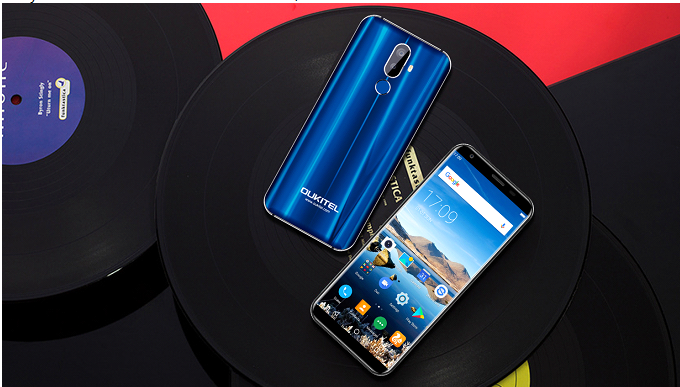 With latest 18:9 full display, large battery, and super cost-effective price, OUKITEL K5 is winning to show itself as next sales killer. The new OUKITEL K5 combines Chinese classic porcelain elements with modern 3D space design and fashionable IML craft, creating a delicate elegant creature. It is 2.5D curved on the 5.7 inch HD+ 18:9 display and 3D curved on the brilliant IML crafted battery cover. Though 5.7 inch large display with 720x1440 resolution, it gets a slim and thin body to hold and handle in one hand. As a popular full screen smartphone, OUKITEL MIX 2 is worth buying not only due to its large screen. It is powered by MediaTek helio P25 octa-core soc with 4 cores of 2.39GHz and 4 cores of 1.69GHz CPU. To match the powerful chipset, it runs on 6GB RAM and 64GB ROM with 512GB expandable memory. This is the first time for OUKITEL to do 6GB RAM and helip P25 Soc device, but OUKITEL optimized the software to make it perfect.